National disability charity, United Response, first launched Easy News back at the beginning of 2013 in a bid to give people with learning disabilities, and anyone else who wanted to, the opportunity to find out about world events, in order to gain a greater understanding of current affairs and how politics affects our everyday lives. As the 19th issue of Easy News is published, results from the latest survey of the readership reveal that 99 percent of them feel they have a better understanding of what is happening in the world, whilst 97 percent are now able to discuss current news events. A further 93 percent of respondents feel they are taking a greater interest in politics. 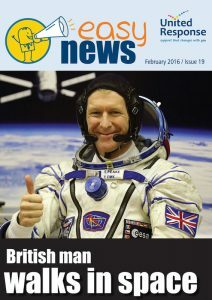 The 19th issue of Easy News features news of Tim Peake, the first British man in space, and the global warming agreement, as well as an outline of what the European referendum means and details of the Junior Doctors’ strike. Each issue has a variety of quick news stories and this month’s edition includes an update on the Government’s “Bedroom Tax”, along with information about the big sporting events taking place this year. Be the first to comment on "Survey of Easy News readers reveals that people with learning disabilities are more engaged as a result of accessible news service"